KT signed an agreement with the United Nations Environment Program to provide consultations on uses of information communications technology with a view to resolving global environmental issues such as fine dust, the mobile carrier said Thursday. Under the agreement, KT will support UNEP in establishing an integrated platform for handling global environmental issues, data analysis on activities to reduce fine dust, and measures to help vulnerable groups of people to combat fine dust in developing countries. The mobile carrier will apply its big-data platform to UNEP’s global monitoring system for fine dust and will provide consultations on ways to improve UNEP’s Environment Live platform. 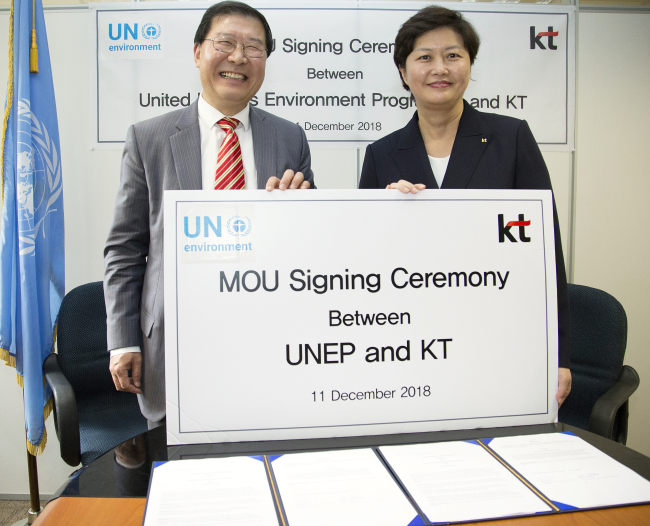 “KT will work with UNEP to make the earth cleaner by using our cutting-edge technologies,” said Lee Mi-hyang, vice president at KT’s future platform business division.